I feel terrible about neglecting* my blog (and it's readers) for almost 2 months but there have been a lot of things that needed to be sorted out but I am back! 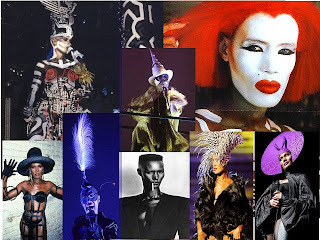 I'm more excited about the return of two of my fav ladies in showbiz though - Grace Jones & Cyndi Lauper. Both are looking super hot for their age (Grace is 60 and Cyndi is 55) and I'm glad to see they haven't lost their quirky sense of style (their songs are still pretty banging too). Dream outfit I'd like to see Grace in: one of these from new designer Andrea Cammarosano. Grace likes her outfits to be structured and eye-catching so this should be right up her street. She's also a fan of black so would be nice to see some splashes of colour on her. 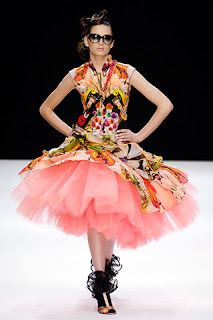 Dream outfit I'd like to see Cyndi in: this dress from Basso & Brooke's Spring 06 collection. 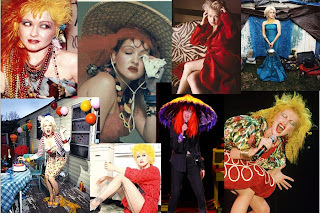 Cyndi is the complete opposite of Grace - a huge fan of colour. Also this dress has the fun elements of her past 80's outfits, so I can really see her bringing this dress to life. *I haven't been totally neglecting le blog - I've added more links on the right hand side and all the posts are now conveniently labeled. Also I will be going to PARIS for a day trip as a Birthday treat on 16th so any recommendations would be mucho appreciated as the last time I went with my mother. When I was 12. She made me stay in the Louvre for over 3 hours. I hated it.